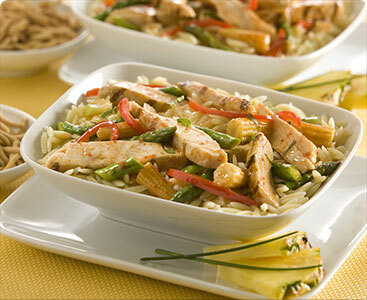 One of the easiest and healthiest Chinese recipes is chicken stir fry. Preparation time is very short and quick. A superb way to receive vitamin-rich vegetables and protein is by mixing fresh vegetables such as peas, carrots and snow peas and deboned chicken. You can also use indispensable Chinese flavorings like soy sauce, garlic and ginger. In velveting the chicken, slice the chicken meat into small pieces, just bit-size. In a bowl, combine 1 tablespoon corn flour and the egg white by beating the mixture. Pour the chicken into the bowl and use the mixture to coat the chicken meat. Set aside for 15-30 minutes to marinate. Never place inside the refrigerator otherwise the mixture will harden. Prepare the perfectly cooked rice. Under cold tap water, rinse the rice placed in a strainer until the water runs clear. Drain excess water from the rice and pour the rice into a pan with a lid. Add a pinch of salt and pour over 600mL water. Cook the rice uncovered for 10 minutes after the water comes to a boil. When small craters appear and the water has almost boil away, cover with the lid and set the heat to the lowest that it can go and leave to cook for another 10 minutes. Prepare the ingredients. Use a teaspoon to strip the skin of the ginger then chop finely until you get 1 tablespoon. Cut the pepper into two, remove the seeds, inner pith and stalk then slice into bite-size pieces. Skin the garlic clove and shallot then slice thinly. If you are using chili, trim the ends off and cut into thin slices. If you like it milder, remove the seeds from the chili. Take out the chicken meat from the marinade made of egg mixture. Use kitchen paper to pat the meat dry. Prepare for stir-frying. Pour in 1 tablespoon oil in a heated wok. Fry the chicken and toss until just cooked, takes about 7 to 10 minutes. Set the cooked chicken meat aside. If there’s a need, pour more oil, toss the pepper and cook for a minute. Add the garlic, shallot and ginger for another 1 to 2 minutes. Mix 50mL water, 1 teaspoon corn flour, lime juice and fish sauce. Pour into the wok then toss the chicken. Stirring through the basil, cook for 1 minute. Serve together with rice.